Sometimes you have to pinch yourself. Dutch cities like Haarlem are so loaded with history and beauty that they’re almost too perfect. The windmill overlooking the canal, the cathedral in the main square, and the jewelry shops huddled against the church walls – in houses that belonged to the poor in centuries past – are solid yet elegant, a metaphor for the city’s inhabitants. 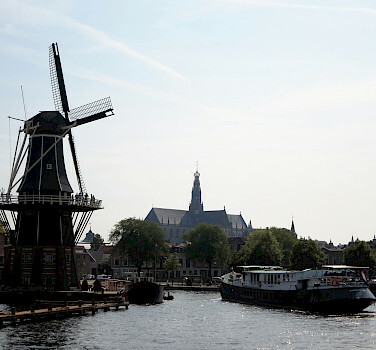 A majestic windmill beside the canal welcomes us to our first stop – Haarlem, a city of about 150,000. Excited like on the first day of school – with new friends and new adventures ahead – my wife, brother and I check into our barge back in Amsterdam; get our room assignments; do a preliminary unpack; and rush back to the deck to wave good-bye to passersby as our captain guides The Wending down the canals toward Haarlem. We strike up conversations with the Alaskans, Canadians, Italians and Germans on our boat. 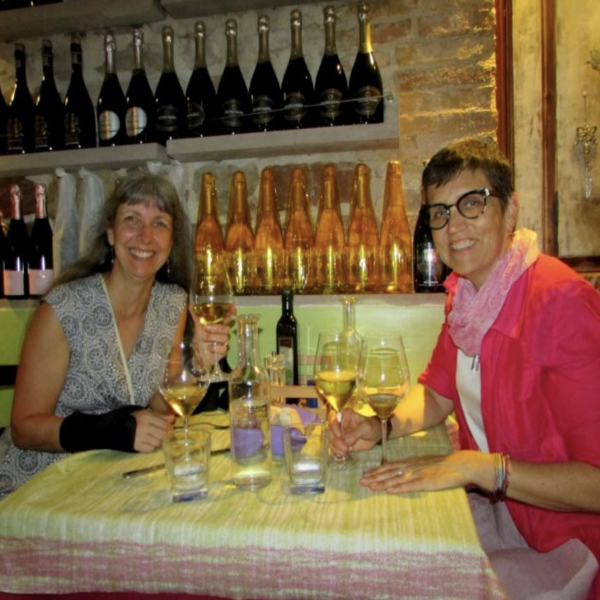 The joy of a cycling vacation bursts forth. Our bikes sit on deck as our captain navigates the canals. He calls bridgemasters who use remote controls to open the way for us. The sun sets late in July in Holland, so we have plenty of light for a “shakeout” ride after dinner. It’s important for the guide and riders to learn each other’s riding styles, refresh knowledge of the rules of the road, and practice moving as a group. English spontaneously becomes our lingua franca; within minutes, everyone’s pronunciation of “Car back!” is perfect. But this 12-kilometer cruise along pristine paths, in the long shadows of the late day, is also a chance to enjoy picturesque houses with perfect gardens, cows grazing in front of a windmill; and a statue dedicated to the “Hero of Haarlem” – the “sunny-haired boy of gentle disposition” who legend says saved many from drowning by sticking his finger in a dike centuries ago. Holland has high population density but plenty of open spaces for great riding. Travel always makes me a little philosophical –not just when riding to the home of Holland’s oldest university in Leiden. Why does one culture invest in infrastructure (such as great bikepaths) while another doesn’t maintain its sidewalks? I ask myself. But a thing that really hits me today is seeing a massive pumping station in a polder named Blijdorp. A polder is an area, often huge, reclaimed from water by massive pumps. (This particular steam engine was the first built by Scottish inventor James Watt in the Netherlands, in 1786.) Apartments, businesses, towering trees and even an airport now occupy space that is several meters below sea level. Its normalcy is eerie. Everything would be under water in just two years if the pumps stopped. These massive pumps make life in large parts of the Netherlands possible. Without them, entire towns would be under water. This original steam pump has been replaced by modern ones. Browsing shops, we see that Dutch consumers are willing to pay more for meat from animals raised in humane conditions, and everything we see suggests the producers are listening. 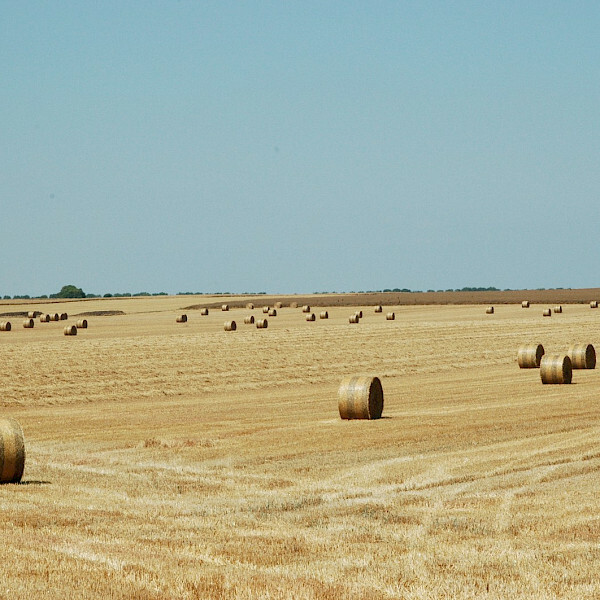 We ride through beautiful farmlands. We see a couple llamas (with funny buck teeth) but mostly cattle and horses, including a foal running with grace and energy around a corral. 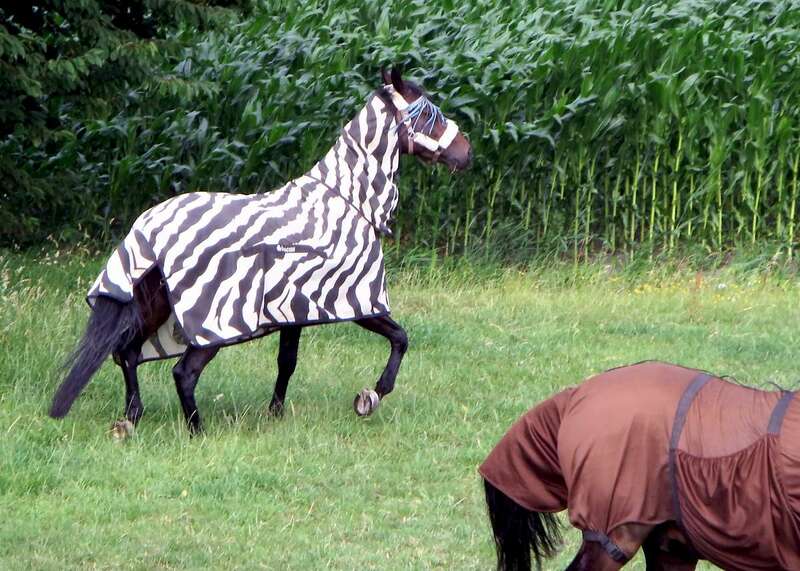 A Dutch friend told me to be on the lookout for one of the Netherlands’ rare zebras, but I don’t see one yet. 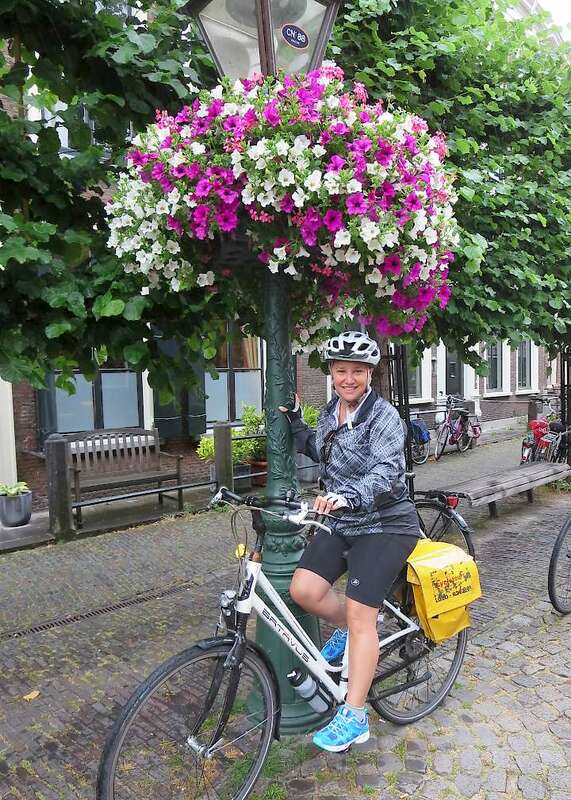 We ride through a couple drizzles today, and the winds along the North Sea coast are strong – and oddly always in our face – but the fragrance of the flowers and trees along our way are exhilarating. In the dunes region, brown flowers smell as sweet as lilacs back home in Virginia, and the pines (yes, pines in the Netherlands) give off a fresh, clean odor. Even under grey skies, we feel joy. Guides balance the needs of both experienced and inexperienced riders; between those eager to get to our destination and those stopping to admire and photograph the curiosities along the way. Ours reads us well, briefing us on our options each day. 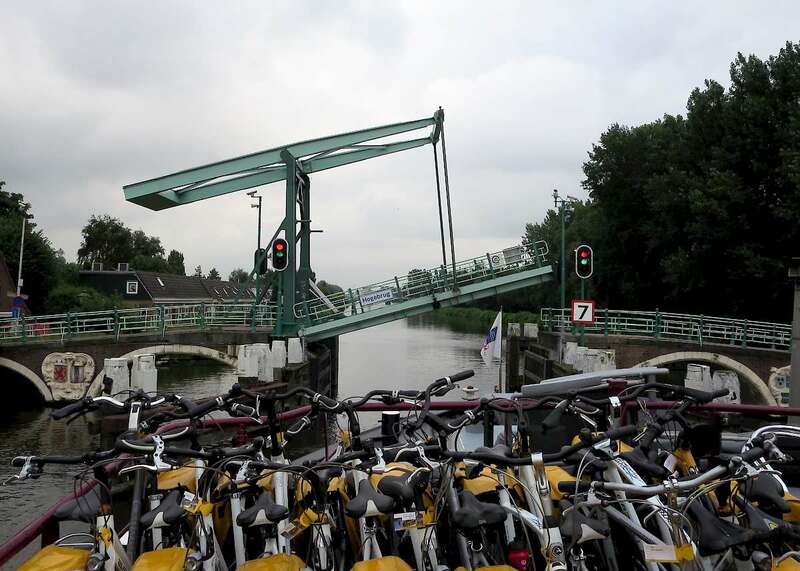 The Dutch system of bikeways – the fietspads – is a connect-the-dots system in which you travel between numbered points or junctions. 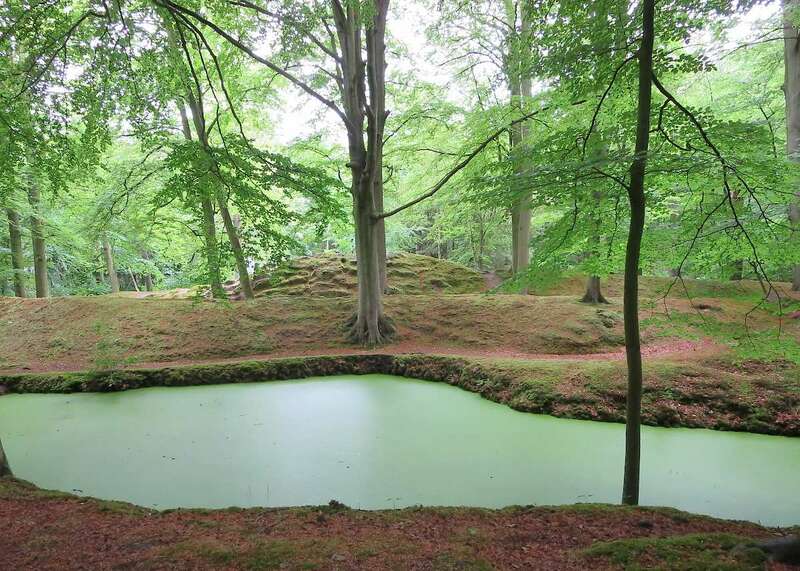 We couldn’t have gotten lost in a prettier place, in a suburb of The Hague. Confident that we’d learned how to navigate the system, several of us go off on our own for part of the day – getting lost only a couple of times along the way. 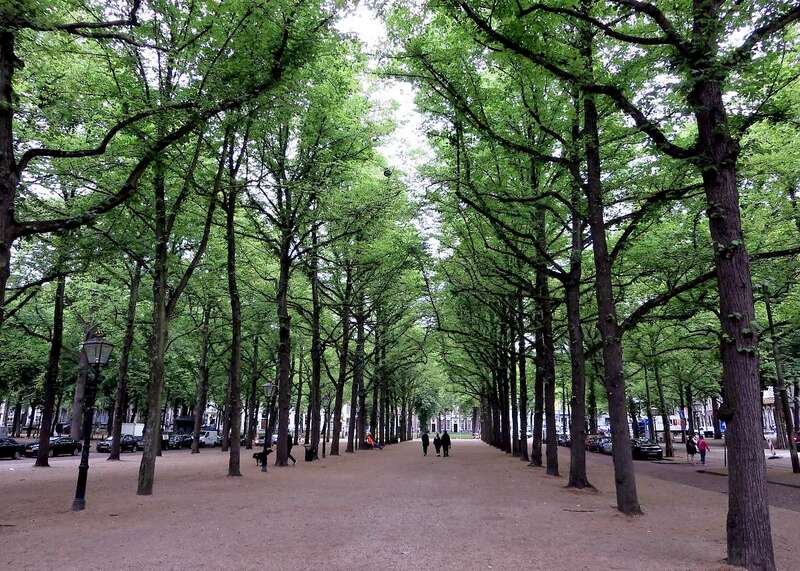 One detour takes us into a park in a swanky neighborhood near The Hague that must be one of the greenest corners on earth. A woman we hail for directions turns out to be a town Alderman, and she graciously opens the Town Hall bathrooms for us to freshen up. Not seeing the fietspads markers, we cheat a little with GPS as we find our way into The Hague and met our fellow cyclists in front of the magnificent “Peace Palace,” seat of the International Court of Justice. The rain didn’t dampen our enthusiasm for the windmills. Their majesty and grace are inspiring – and they’re a fascinating link to current alternatives to fossil fuel. The Hague and Delft are full of treasures. The museum housing the work of M.C. Escher, with pictures of endless staircases and other optical illusions, is one. Also brilliant is a museum devoted to Hendrik Willem Mesdag, who painted a 360-degree vista of the sea, beach and village of nearby Scheveningen as it was around 1880. 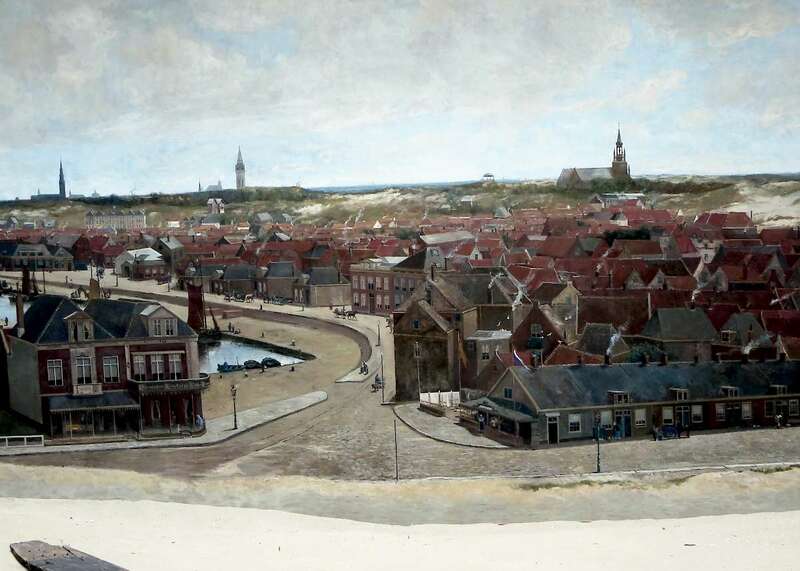 A detail of the 360-degree painting of the fishing town of Scheveningen, next to The Hague. You climb stairs to enter the circular room. 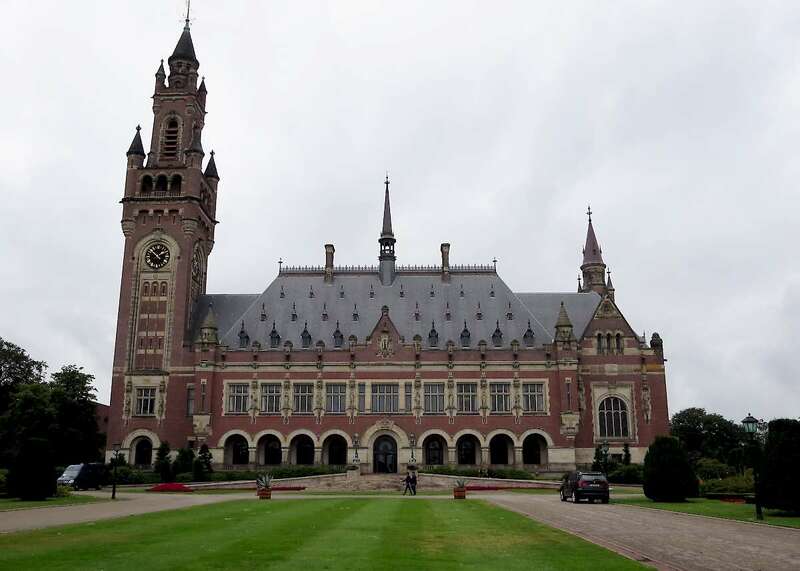 The Peace Palace is the home of the International Court ofJustice, which puts alleged perpetrators of crimes against humanity on trial. It’s an symbol of the rule of law. Despite low, dark clouds, we barely feel a few drops of rain. Our ponchos stay snugly in our saddle bags. Delft is famous for elegant hand-painted ceramics in a distinctive blue tone. Canals (many without guardrails) crisscross the city. The cathedral bell tower lists away from the rest of the church, sign of how soft its water-soaked foundation has become over the centuries. The raw herring – dipped whole into our open mouths – is extraordinarily good, and the beer washing it down is superb. The Hague is a supremely elegant city. 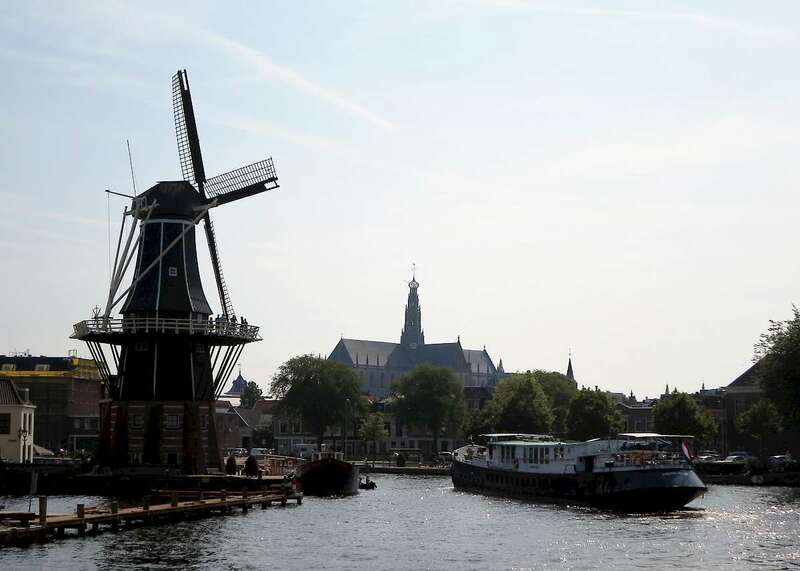 Amsterdam is really the national capital – King Willem-Alexander resides there – but the government and embassies accredited to it are here in Den Haag. So are many beautiful parks! The rain bothers you only if you let it. True, the first couple minutes are bothersome, but the simplest equipment – a five-dollar poncho – does as well as $200 fancy raingear. Think European markets are dark and smelly? 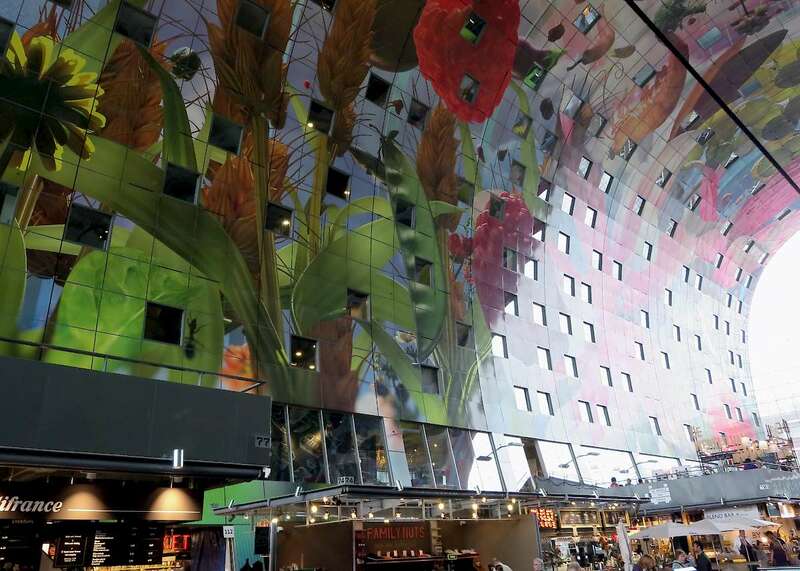 Think again …and welcome to Rotterdam’s modern market. 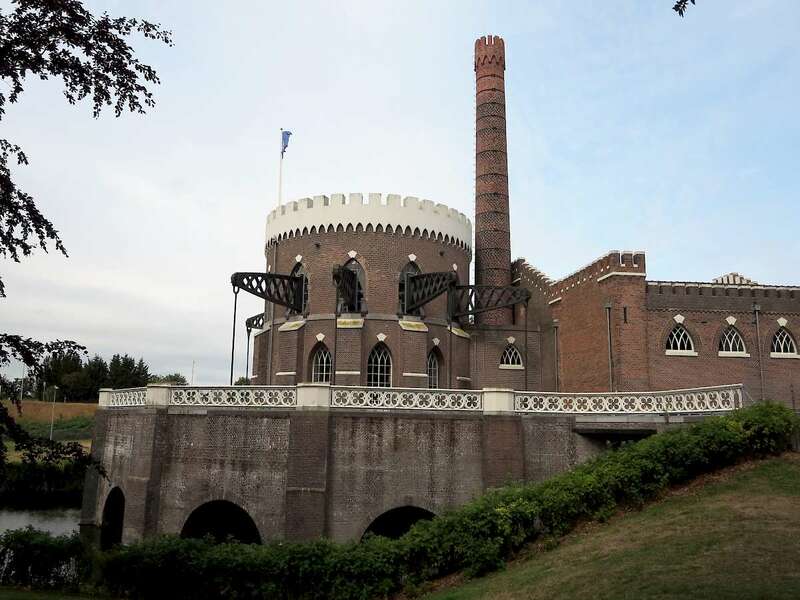 The Wending takes us to the city limits of Rotterdam, but we explore this exciting city by bike. We visit cube-shaped houses, cross the distinctive Erasmus Bridge, and get snacks at the city’s modern new market. A fast ferry later takes us to the tranquility of an agricultural zone with Holland’s greatest concentration of operating windmills. 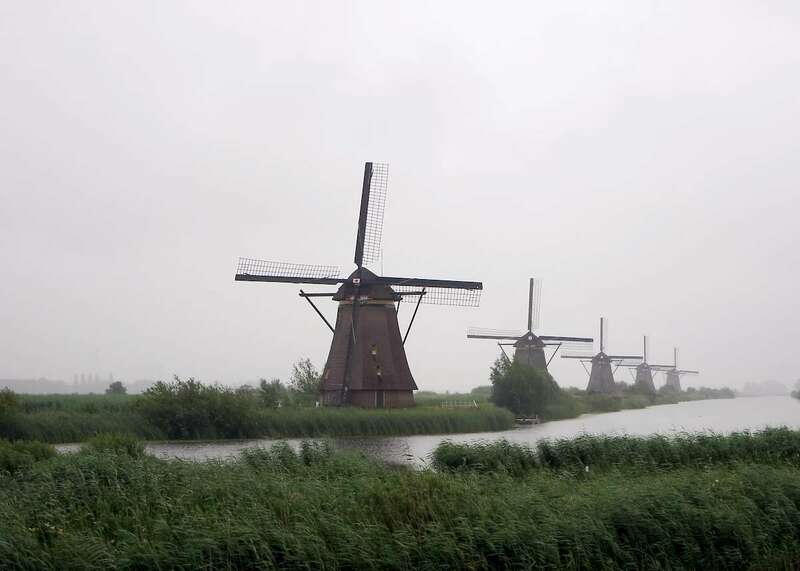 We barely feel the rain and arrive at the barge that evening, in the cheese-producing town of Gouda, pleased by the contrast of technologies we’ve seen all day – from cube houses to windmills. But I still haven’t seen a zebra. My wife and I have visited hundreds of churches over the years, but few have fascinated us as St. John’s Church in Gouda has. Our docent (and published author), Maurits Tompot, brings history alive by interpreting the temple’s stained glass windows as if they were a graphic novel. The Gouda cheese market is cool too, but the highlight of the day is St. John’s. 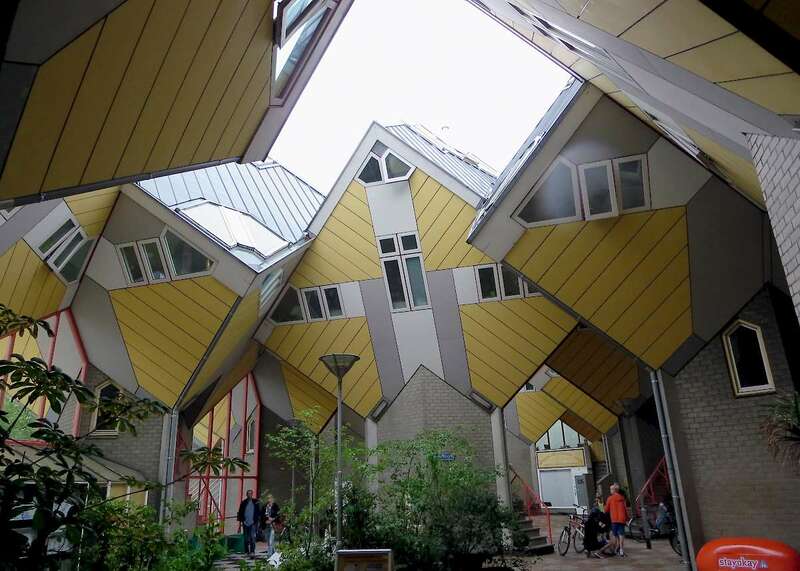 Bizarre-looking from the outside, the “Cube Houses” of Rotterdam are also odd on the inside. We saw that almost all of the furniture had to be custom-built to fit against the sharply angled walls of each external wall. Some are for sale … so call your agent now! On this last day of riding, we waste no time. We tour the wholesale flower market in Aalsmeer – the biggest in the world – which buys and sells blooms across three continents. Electric carts zoom from station to station on the massive floor, assembling orders placed in the bidding room upstairs. 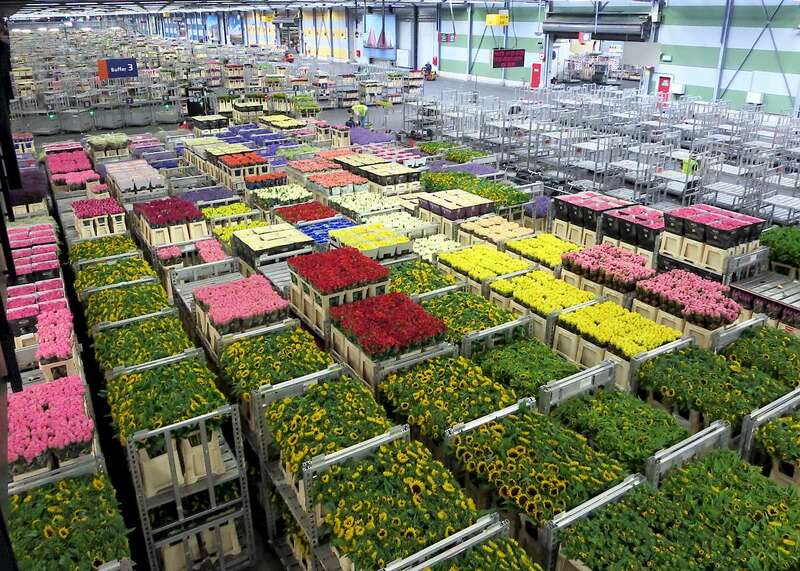 In the world’s biggest flower distribution center, buyers wrangle over prices upstairs, while carts in the warehouse scramble to get orders out the door. 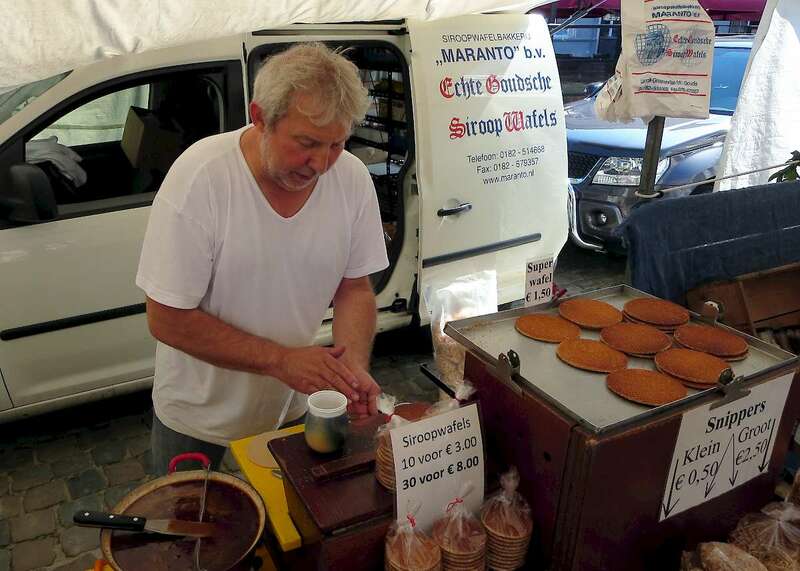 Siroopwafels, also called stroopwavels, make Oreos look tame. Between two thin waffle layers, the preparer expertly spreads a layer of delicious caramel. They’re to die for. For the rest of the day, we ride through magnificent farmland populated by wild geese. We sample artisan cheese, and we watch a young man make wooden shoes. Beneath a bright blue sky, we take in the sights hungrily – knowing that tomorrow we say our goodbyes and head our separate ways. Be sure to check out all of our Bike and Boat tours in Holland! 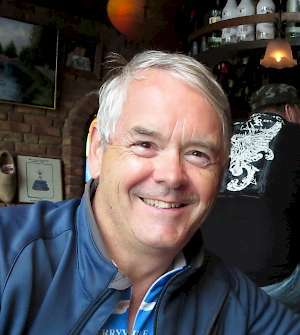 Fulton Armstrong worked in the U.S. government for many years and currently teaches at the American University in Washington, DC. Fulton, are you riding the bike from destination to destination and the boat you are staying on is following Along on a canal? Just trying to get an idea of how this works. Going with someone who doesn't ride a bike. Yes, that's the basic approach: Bikers leave the boat and go "inland" to enjoy the countryside and towns while the boat follows the canals to the destination for that night. But non-riders (of whom there have been four or five on each of the trips I've made) also have a great time. 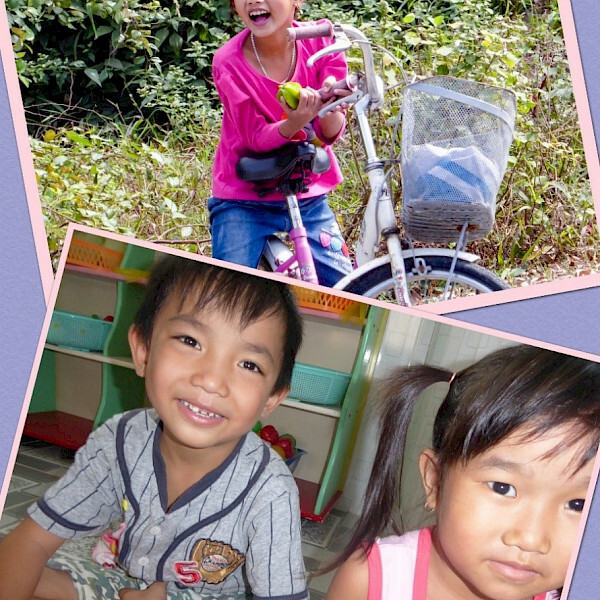 Cruising the canals gives them great vistas, fresh air, and quiet time to read or nap or chat or write postcards for their bike-bound companions! 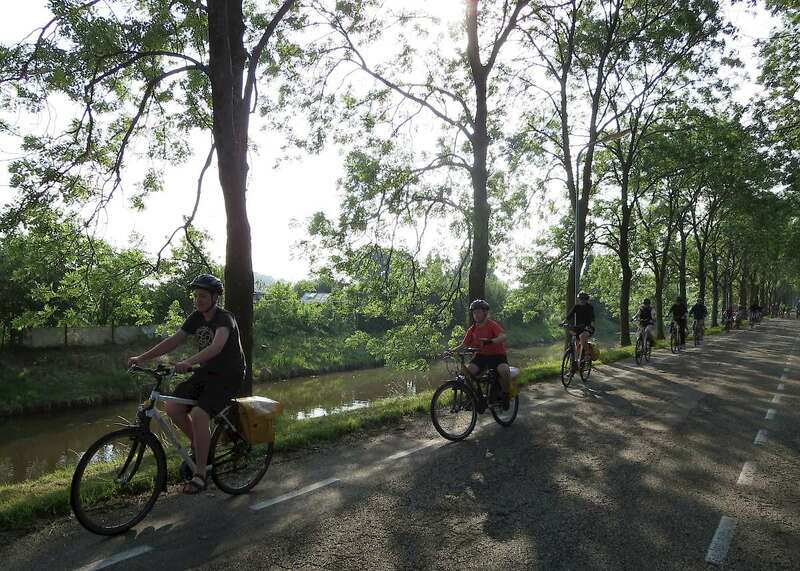 On many routes, captains and guides also find a half-way point along the route where riders come near the canal -- and end their rides for the day or people can join them. I love this model of touring for a bunch of reasons. You get to see truly stunning things from your bike or your easy chair on the boat. You unpack/pack only once. Your bed is just a couple minutes' walk from the center of these cool river towns. And you never see the same thing twice!